These carrot and parsnip fries, pre-fried in sunflower oil, are deliciously crunchy. 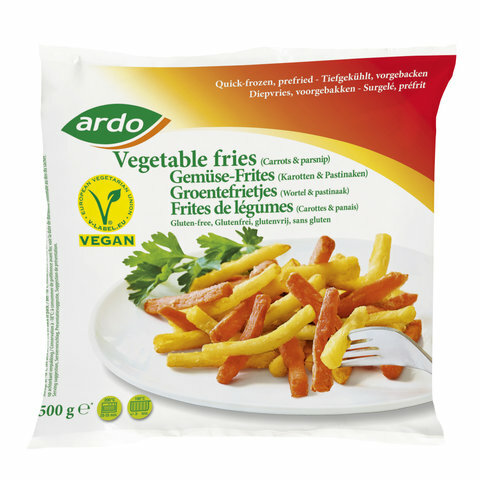 The vegetables give the fries a slightly sweet taste. Our tasty fries can be prepared in the deep fryer or the oven. A delicious alternative to classic potato fries! Carrots 52%, parsnips 34%, sunflower oil, rice and maize flour, modified potato starch, potato dextrin, salt, raising agents: diphosphates and sodium carbonates, stabiliser: xanthan gum, extracts of spices: paprika, turmeric. Place the vegetable fries in a single layer on a baking sheet. Bake in a preheated oven at 200°c for 20-25 min or until golden and crispy, turning once. Tip: the vegetable fries become extra crispy by using aluminum foil on the baking tray. 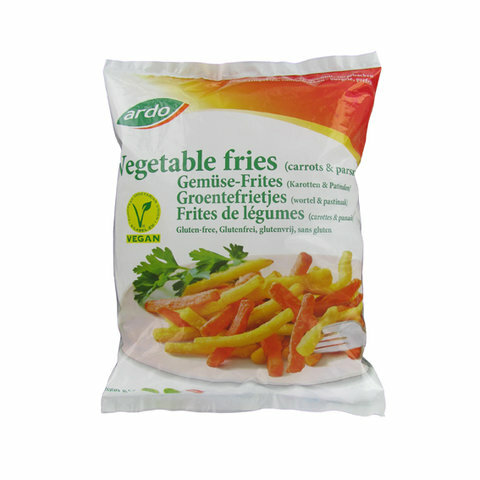 Deep-fry the frozen vegetable fries for 3-4 minutes in pre-heated oil of 175°C. Do not fry too many product at once to avoid having heat loss.